Micronesia is a subregion of Oceania, composed of thousands of small islands in the western Pacific Ocean. It has a shared cultural history with two other island regions: Polynesia to the east and Melanesia to the south. The Northern Mariana Islands, officially the Commonwealth of the Northern Mariana Islands, is an insular area and commonwealth of the United States consisting of 14 islands in the northwestern Pacific Ocean. The CNMI includes the 14 northernmost islands in the Mariana Archipelago except the southernmost island of the chain, Guam, which is a separate U.S. territory. The CNMI and Guam are the westernmost point and territory of the United States. 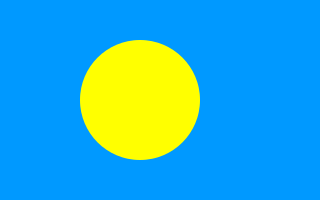 Palau, officially the Republic of Palau, is an island country located in the western Pacific Ocean. The country contains approximately 340 islands, forming the western chain of the Caroline Islands in Micronesia, and has an area of 466 square kilometers (180 sq mi). The most populous island is Koror. The capital Ngerulmud is located on the nearby island of Babeldaob, in Melekeok State. Palau shares maritime boundaries with the Philippines, Indonesia, and the Federated States of Micronesia. 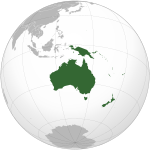 The Trust Territory of the Pacific Islands (TTPI) was a United Nations trust territory in Micronesia administered by the United States from 1947 to 1994. 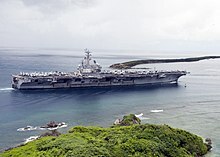 Saipan is the largest island of the Northern Mariana Islands, a commonwealth of the United States in the western Pacific Ocean. According to 2017 estimates by the United States Census Bureau, Saipan's population was 52,263. Tinian is one of the three principal islands of the Commonwealth of the Northern Mariana Islands. Together with uninhabited neighboring Aguigan, it forms Tinian Municipality, one of the four constituent municipalities of the Northern Marianas. 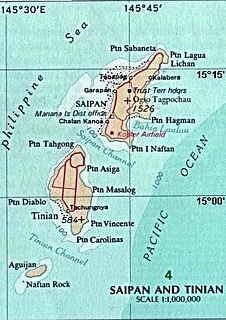 Tinian's largest village is San Jose. Chamorro is an Austronesian language spoken by about 58,000 people. It is the native and spoken language of the Chamorro people who are the indigenous people of Guam and the Northern Mariana Islands, both US territories. The Mariana Islands are a crescent-shaped archipelago comprising the summits of fifteen mostly dormant volcanic mountains in the western North Pacific Ocean, between the 12th and 21st parallels north and along the 145th meridian east. They lie south-southeast of Japan, west-southwest of Hawaii, north of New Guinea and east of the Philippines, demarcating the Philippine Sea's eastern limit. 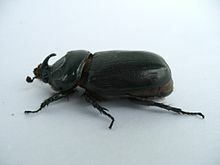 They are found in the northern part of the western Oceanic sub-region of Micronesia, and are politically divided into two jurisdictions of the United States: the Commonwealth of the Northern Mariana Islands and, at the southern end of the chain, the territory of Guam. The islands were named after the influential Spanish queen Mariana of Austria. 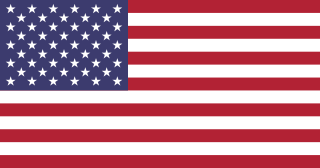 Territories of the United States are sub-national administrative divisions overseen by the federal government. They differ from U.S. states and Native American tribes, which have limited sovereignty. The territories are classified by incorporation and whether they have an "organized" government through an organic act passed by Congress. Tamuning, also known as Tamuning-Tumon-Harmon is a Municipality/Town/City or village located on the western shore of the United States territory of Guam. The village of Tamuning can be viewed as the economic center of Guam, containing Tumon, Harmon Industrial Park, and commercial districts in other parts of the municipality. Its central location along Marine Corps Drive has aided in its development. The Chamorro people (/tʃɑˈmɔroʊ/) are the indigenous people of the Mariana Islands; politically divided between the United States territory of Guam and the Commonwealth of the Northern Mariana Islands in Micronesia. Today, significant Chamorro populations also exist in several U.S. states including Hawaii, California, Washington, Texas, Tennessee, Oregon, and Nevada. According to the 2000 Census, approximately 65,000 people of Chamorro ancestry live in Guam and another 19,000 live in the Northern Marianas. Another 93,000 live outside the Marianas in Hawaii and the West Coast of the United States. The Chamorros are primarily Austronesian, but many also have European (Spanish) and East Asian ancestry. 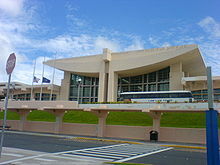 The United States territory of Guam is divided into nineteen municipalities, called villages. Each village is governed by an elected mayor. Village populations range in size from under 1,000 to over 40,000. As of the 2000 census, the total population of Guam was 154,805. However, the entire island is counted as a single county equivalent by the United States Census Bureau for statistical purposes. The First Battle of Guam was an engagement during the Pacific War in World War II, and took place from 8 December to 10 December 1941 on Guam in the Mariana Islands between Japan and the United States. The American garrison was defeated by Japanese forces on 10 December, which resulted in an occupation until the Second Battle of Guam in 1944. The following is an alphabetical list of articles related to the United States Territory of Guam. Barrigada is a village in the United States territory of Guam. A largely residential municipality, its main village is located south of the Antonio B. Won Pat International Airport near the intersections of Routes 8, 10, and 16. The community east of the airport known as Barrigada Heights is considered an affluent neighborhood on the island, where homes have excellent views overlooking much of Guam including the island's airport and hotels along Tumon Bay. Another significant location is Mount Barrigada, nearly 200 meters above sea level. Its location in the center of the island means it houses most of the island's radio masts and towers; the position and height make it easier for radio signals to reach the entire island. Tropical Storm Bavi, known in the Philippines as Tropical Storm Betty, influenced the trade winds over the Pacific Ocean and was partially responsible for one of the strongest trade wind reversals ever observed. The system was first noted as a tropical disturbance during March 8, while it was located to the southeast of Kwajalein Atoll in the Marshall Islands. Over the next couple of days the system moved north-westwards through the Marshall Islands, before it was classified as a tropical depression during March 10. The system subsequently moved north-westwards and continued to develop further, before it was classified as the third tropical storm of the 2015 Pacific typhoon season and named Bavi by the Japan Meteorological Agency (JMA) during March 11. After continuing its north-westwards movement, the system peaked as a tropical storm during March 14, before it started to weaken as it approached the Mariana Islands. The system subsequently passed over Guam during the next day, before continuing its west-northwestwards movement as it gradually weakened over the next few days. The system entered the Philippine area of responsibility, where it was named Betty by PAGASA during March 17 as the system weakened into a tropical depression. The system was subsequently last noted during March 21, as it dissipated over the Philippines.